^ R.K. Headland, The Island of South Georgia, Cambridge University Press, 1984. ^ Alan Gurney, Below the Convergence: Voyages Toward Antarctica, 1699-1839, Penguin Books, New York, 1998. 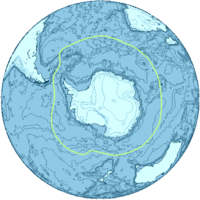 ^ Convention for the Conservation of Antarctic Marine Living Resources 1980, Article 1(4).